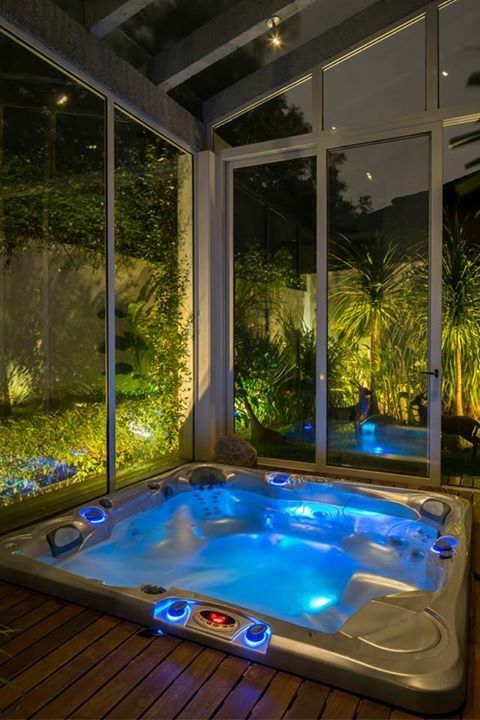 A hot tub simply provides a great pleasure once you have it in your home sweet home. It’s a great addition that will make your home feels way more joyful to enjoy. Obviously, its hydrotherapeutic feature gives you a lot of benefits for your well-being. On daily basis, a hot tub can soothe your stiff muscle and heavy head after a very long tiring day. Moreover, it can reduce the risk of stroke, heart disease, anxiety, and stress. Besides its ability to improve your health, a hot tub will also enhance the beauty and value of your house at the same time. A hot tub is part of your home decoration which becomes one of the major focal points which will bring the style of your place to a whole new level. Then, it’s also a very great investment since it can increase the value of your home. 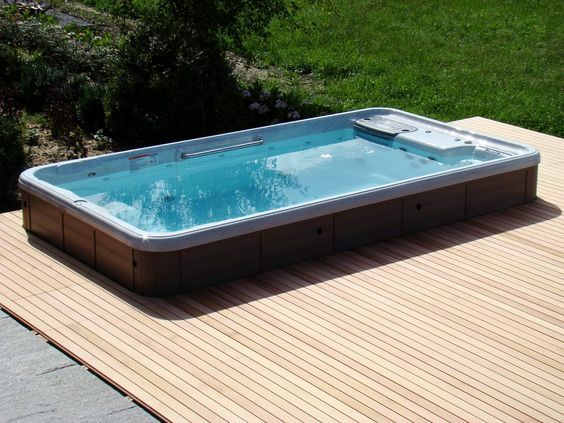 Commonly, there are two ways to install a hot tub which are inground and above-ground. An inground installation type is considered a more effective and efficient one since it provides a better convenient for you to use the tub. 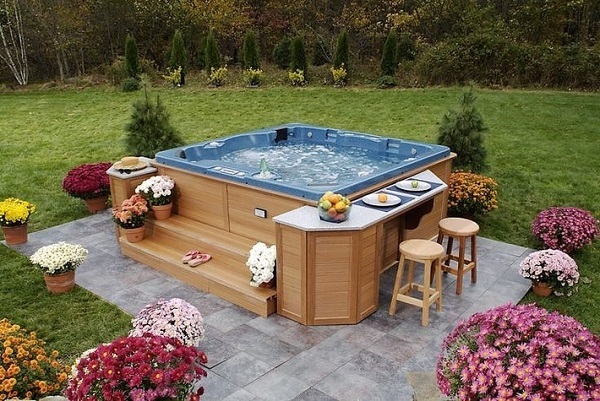 Moreover, an inground hot tub also looks more exclusive than when you place it above the ground. For your inspiration, here we have picked tons of beautiful inground hot tub ideas that will mesmerize you. 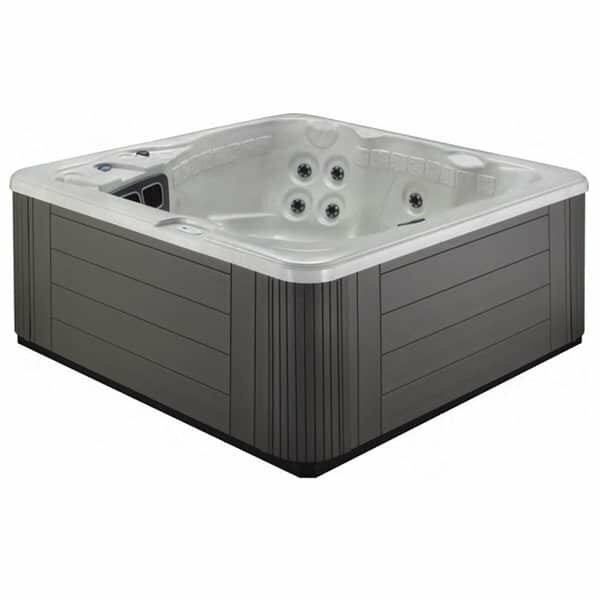 They are so worth to be the ultimate reference when you want to add an inground hot tub to your beloved house. 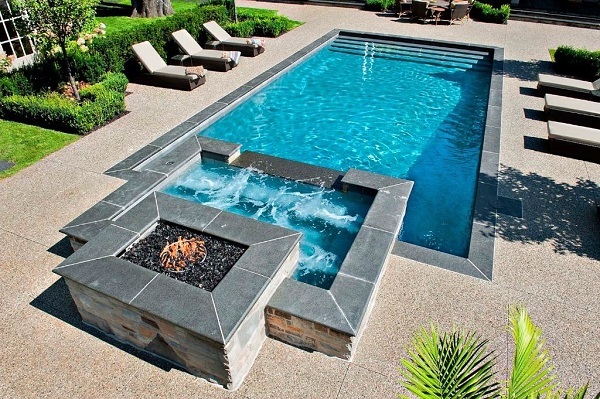 So, let’s just keep scrolling to check out our best picks of inground hot tub ideas! Here, a rectangular hot tub is installed under the deck which is close to the chilling area. 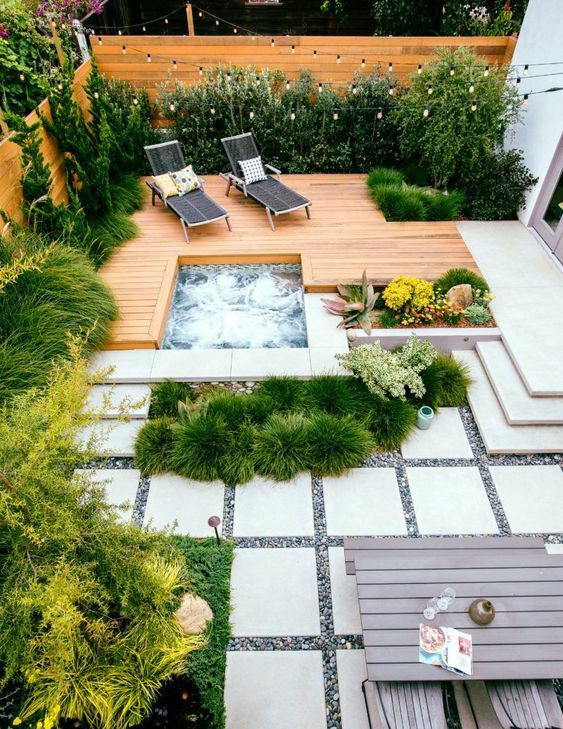 The greeneries which surround the tub matches beautifully with the earthy finish of the deck and fence. Next to the deck is a patio with flagstone and gravel base which makes this backyard look and feel so inviting. 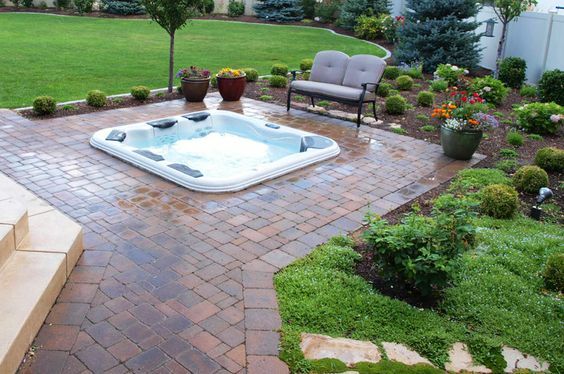 A square acrylic hot tub completes a gorgeous patio with the classic brick base. Its modern design gives another style to the overall look of the patio in a very distinctive way. The garden around the patio even beautifies the yard perfectly. If you want to have a pond and hot tub at once in your backyard, this idea is so inspiring to copy. 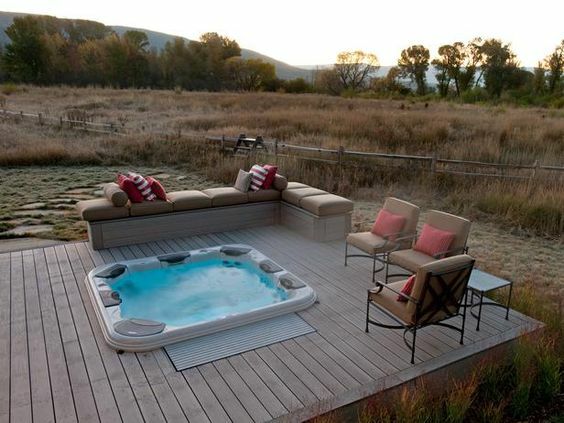 An inground hot tub is installed next to the natural pond with mesmerizing natural decoration. 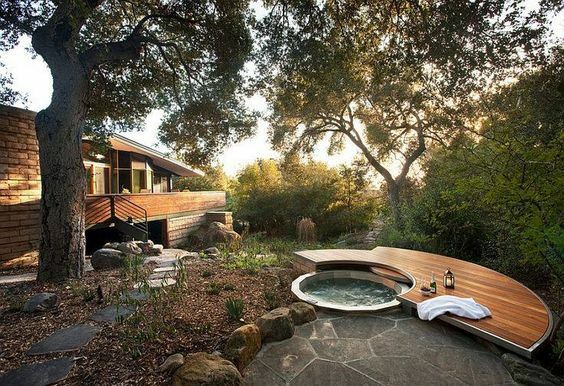 The tub looks so stunning among those rocks and greeneries for sure. This idea is for you who want an intimate spa time with your beloved one. A 2-person hot tub is paced under the sophisticated half-circle deck which looks so awesome. The tub is also completed with the cover which can be hidden under the deck. The rocky surrounding with trees and plantation of this backyard looks so elegant, especially with its inground hot tub as the focal point. 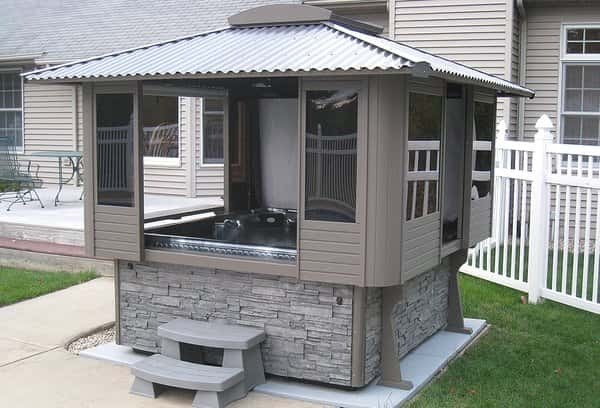 A pergola is always a good addition that makes a hot tub looks more attractive and feels more comfortable. 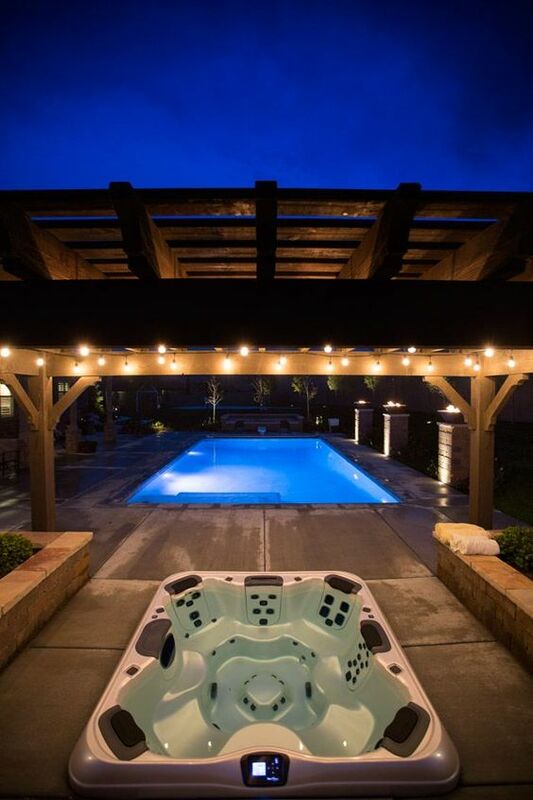 In this idea, an inground hot tub with the concrete construction is shaded by a catchy pergola which comes with the string light to make it look beautiful day and night. The spa area is built close to the swimming pool for the maximum backyard enjoyment. 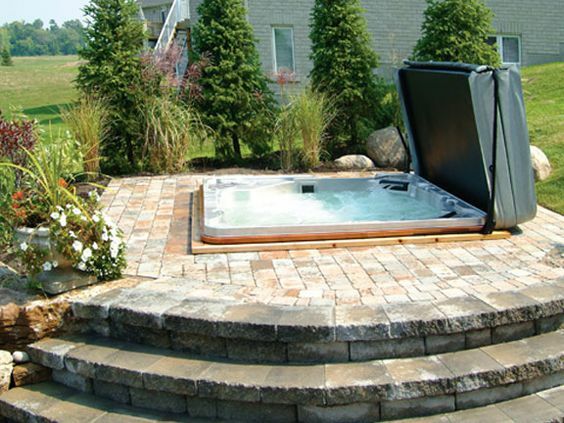 To provide a more hydrotherapy area for everyone, it’s surely a great idea to have two hot tubs in your backyard. 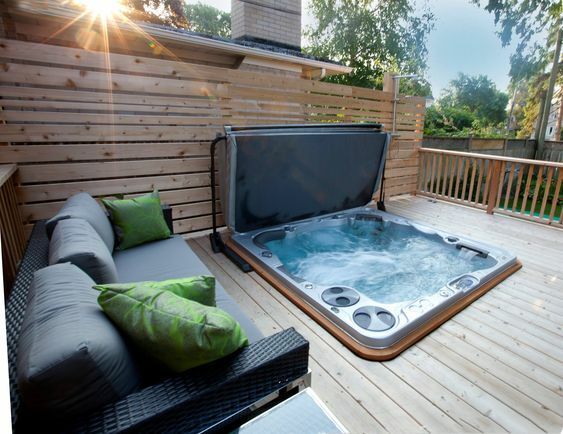 Here, a 4-person and 6-person hot tub are installed in one spacious glossy deck. 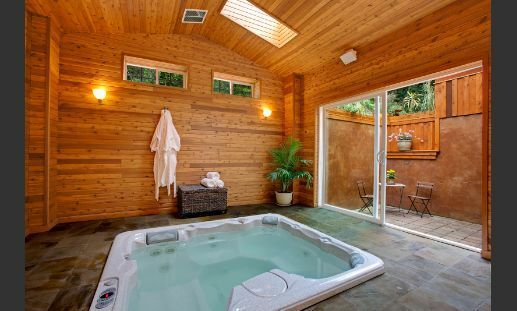 Of course, you can have a very joyful hot tub party once you have this kind of hot tub area in your house. A uniquely beautiful inground hot tub inspiration that will add another style to your outdoor living space. The tub is installed in a private area with the decor that will take you back to the Jurassic era. The tall concrete fence with the rocky surface, a palm tree, built-in sitting area in beige, and gravel surround the inground hot tub with small deck amazingly. 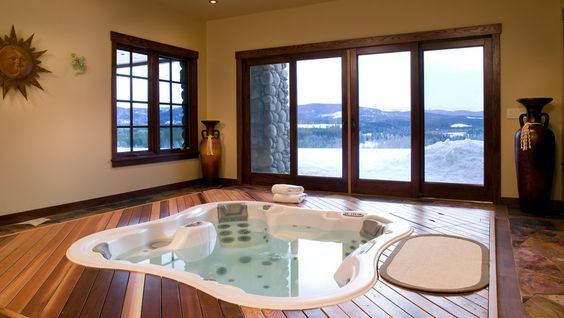 For you who prefer to install your inground hot tub inside a room, this idea can be one of the best references. The spa is placed inside a sunroom with full-glass construction. 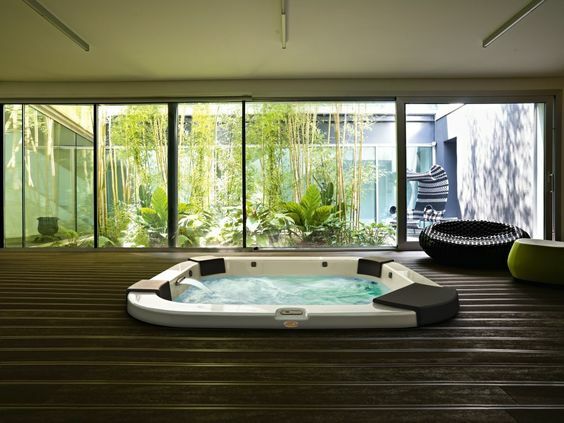 It allows you to have a hydrotherapy moment while enjoying the natural outdoor surrounding. 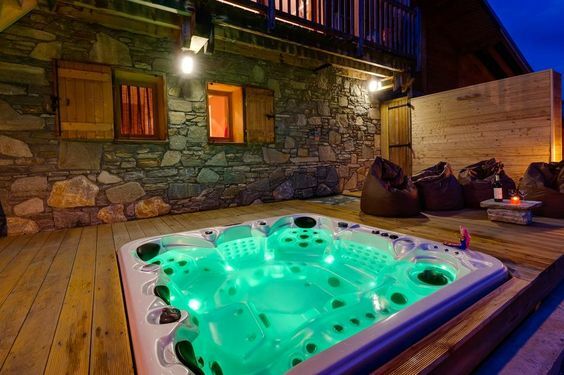 Moreover, you can also use the hot tub in any weather condition as you wish. 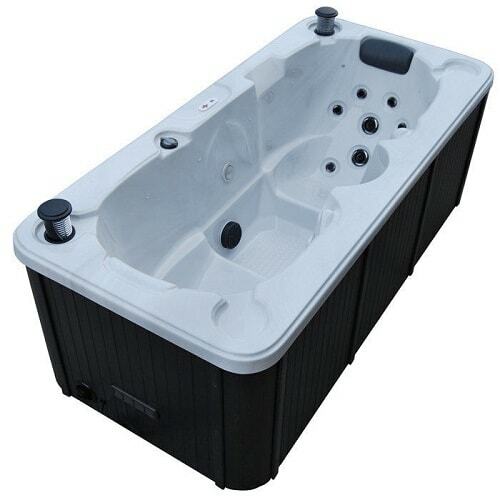 A swim spa is a better solution for a regular hot tub which provides a more exhilarating enjoyment. Here, the swim spa is installed in a room which is built for entertainment. The room itself is decorated in a classic style which makes the swim spa look distinctively stunning. Instead of installing your hot tub in a full inground style, you can try this idea which shows a semi inground one. The spa is placed on a raised deck with its half body is shown which makes it become more noticeable. If you are willing enough to build a huge hot tub room, then you can’t miss this idea. It’s a big room with high ceiling construction which looks so mind-blowing. An inground hot tub becomes the centerpiece of the room which is so stunning with its rocky surrounding and sophisticated step. 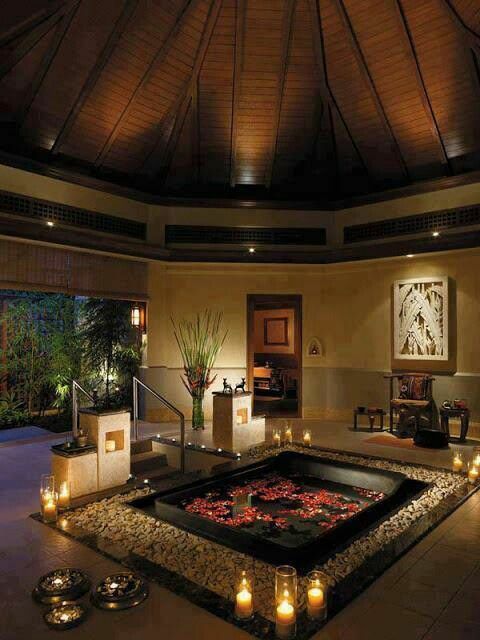 This gorgeous hot tub room is decorated will remind you of the beauty of Asia. The floor is made of wood which resembles the look of a deck and some ottomans complete its decor. a huge window glass lets you enjoy the bamboo garden outside the hot tub room which is so awesome. A fascinating deck with modern furniture is completed with an inground hot tub. The deck is surrounded by the concrete border in a weathered finish which adds a unique touch to its overall look. 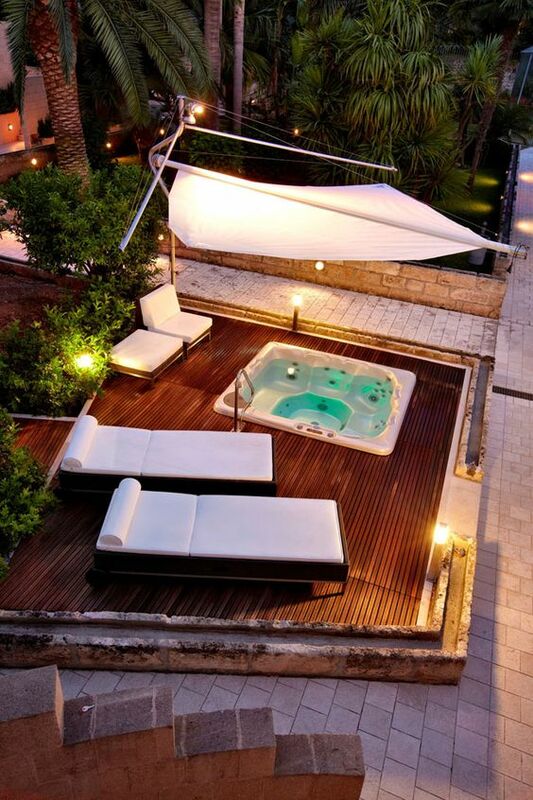 A white sail shade with light enhances the beauty and comfort of this hot tub area very well. This hot tub room looks distinctively attractive with an all-wood interior design which is absolutely perfect for you who love the rustic decor. You can instantly feel a very exhilarating spa atmosphere with the warm earthy nuance of this hot tub room. 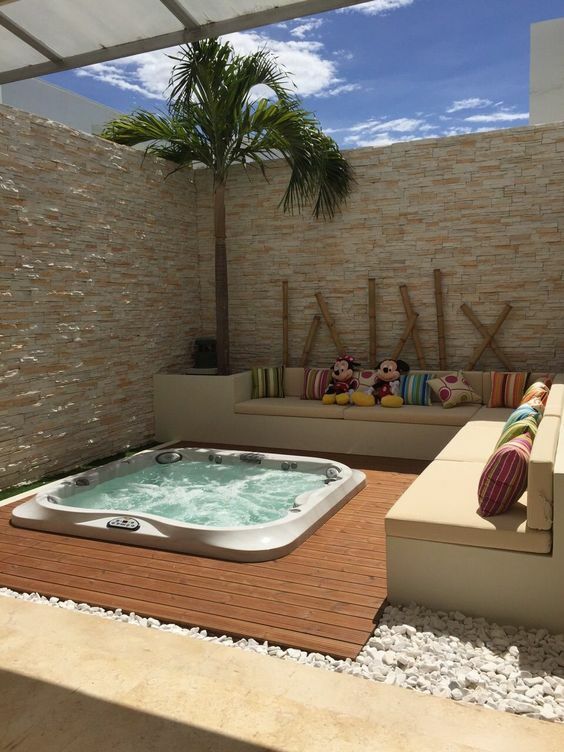 A small cozy patio is also built next to the room which works well as the chilling area after enjoying the tub. 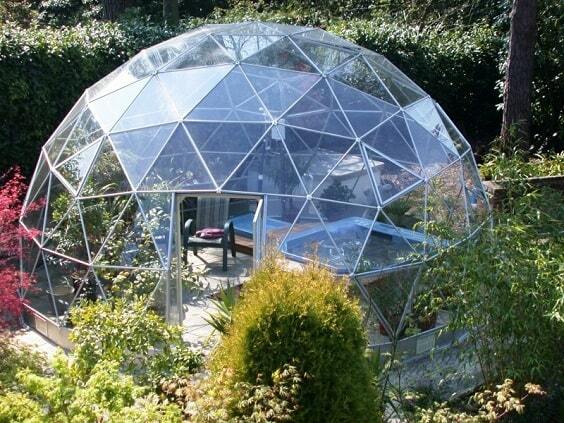 An incredible sun room with dome-like construction which will surely make your outdoor living space looks as attractive as possible. Inside, a hot tub is installed in the center of a deck and some potted trees surround it beautifully. The trees also work as the shade which filters the sunlight exposure inside the room. With its rocky base and wall, bare pergola, and lots of greeneries, this inground hot tub idea looks like a beautiful Tuscan garden. Some cozy outdoor chairs and a fireplace complete the area which to provide a joyful sitting area. 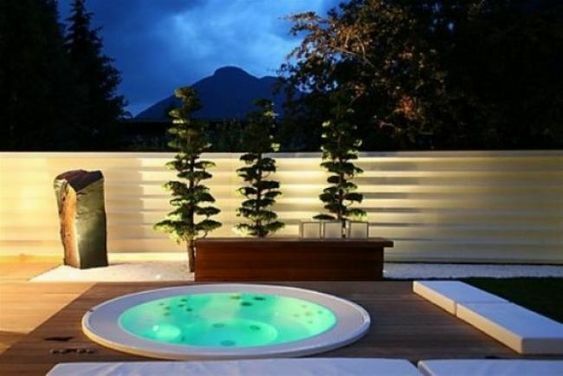 The hot tub adds a modern touch to the decor of the patio which makes it look uniquely wonderful. 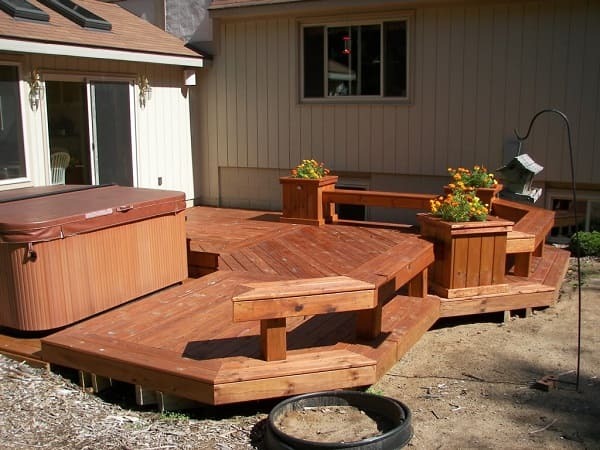 Building the deck with the same height of the tub can be an easy idea to create an inground hot tub that you can try. 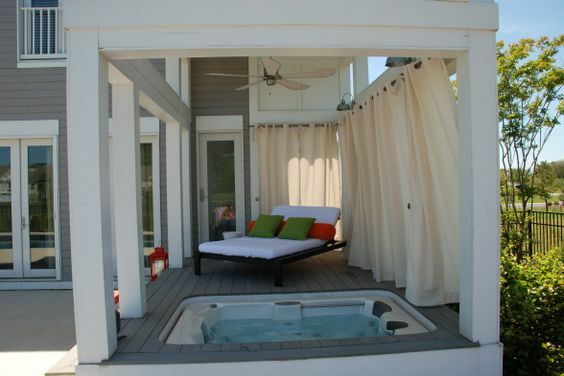 Here, a square hot tub is installed in the center of a raised deck with the privacy screen. An outdoor sofa and accent table become the furniture which enhances the comfort of the deck. Here, a medium swimspa is installed in a semi inground style with the rocky fame beautifully. The spa area is built close the small patio with simple decoration. The grass field and greeneries then give a more attractive touch to this outdoor living space. This one is a good inspiration for you who have a huge outdoor space. A spacious open patio with concrete block base is decorated with a lot of chairs, rocky fireplace, and a custom rectangular hot tub as its centerpiece. It’s absolutely a good area to hold a hot tub party with dozens of guests. A deck with inground hot tub brings the style of a home with rustic rocky wall to the next level. Some bean bag chairs are provided to become the cozy sitting area which also makes the decor of the deck look more stylish. A simple rustic desk with an inground hot tub comes with a built-in L-shape sofa s the additional sitting area. A 3-piece bistro set adds some relaxing spot to chill off after some joyful hydrotherapy times. 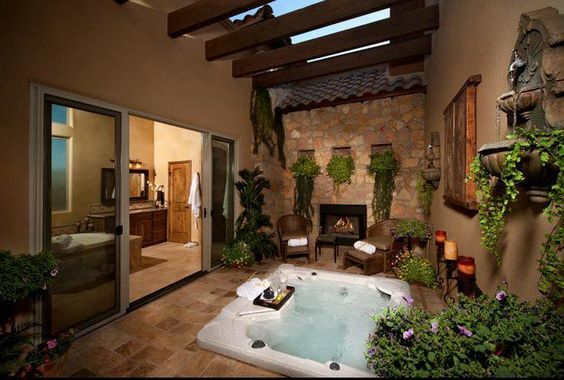 A beautiful hot tub room with simply gorgeous decoration which is so inspiring to copy. The flooring is made of the combination of marble and wood which makes it look more distinctive. 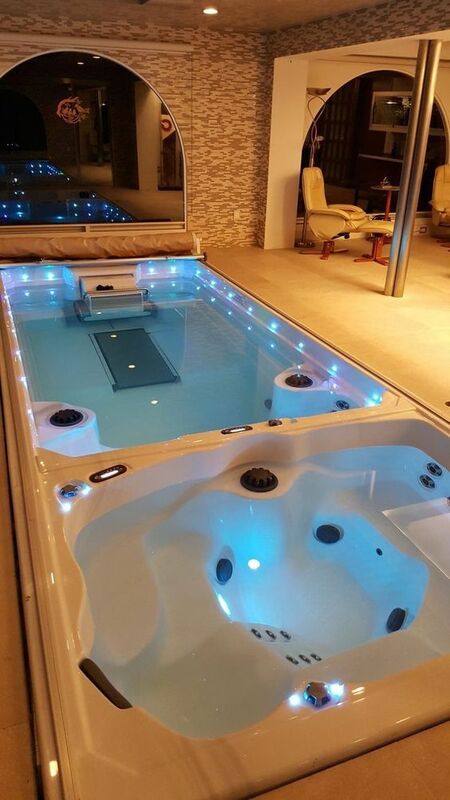 A 4-person hot tub with unique shape surely becomes a striking focal point around the room. 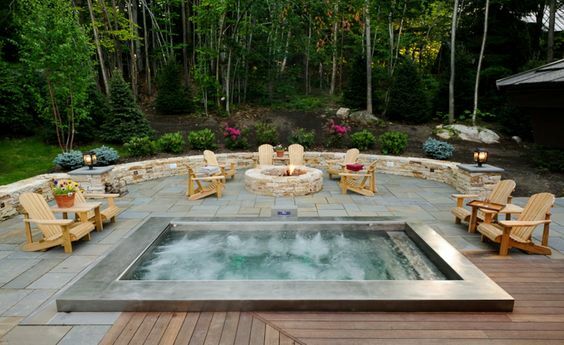 A small round hot tub is installed on the small deck gorgeously. There is no chair or sofa for the sitting area, but some rectangular cushions are provided around the spa which is cozy enough to chill your body off. Some trees and accent light beautify the area and make it look more sophisticated. 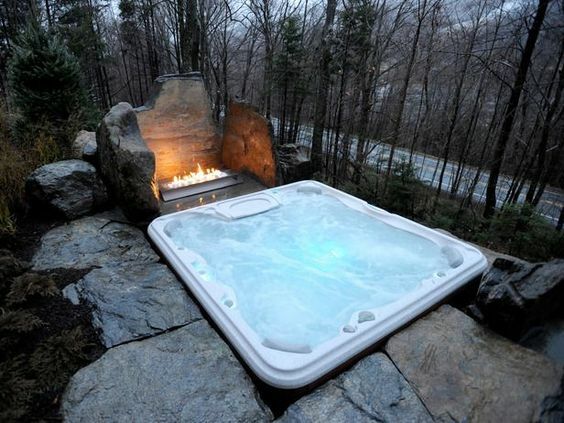 This hot tub area looks so amazing with its huge rocks as its main material. A modern fireplace is then installed close to the tub which makes your hydrotherapy experience feel more exhilarating. A 6-person hot tub is installed in a deck with wonderful pergola in a white finish. Some curtains are attached to the sides of the pergola to provide a better privacy. An outdoor daybed works as a single sitting area here. The construction of this inground hot tub ideas is made of some bricks and concrete block in a rustic finish which is so gorgeous. Some flowers and trees around give a more colorful touch in a natural way. 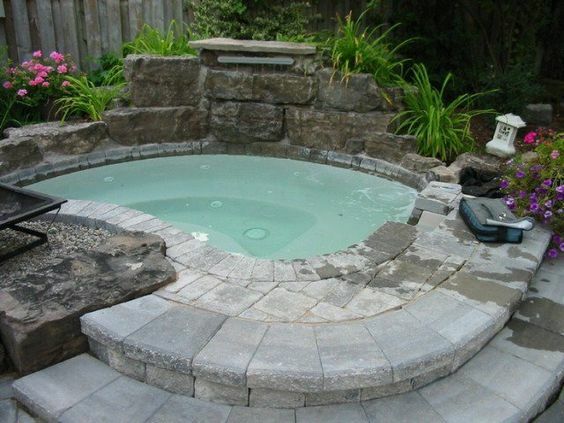 The landscape of this inground hot tub idea is mainly made of concrete block and rocks in natural finish. It looks solidly beautiful and will give a classic vibe in your outdoor space. 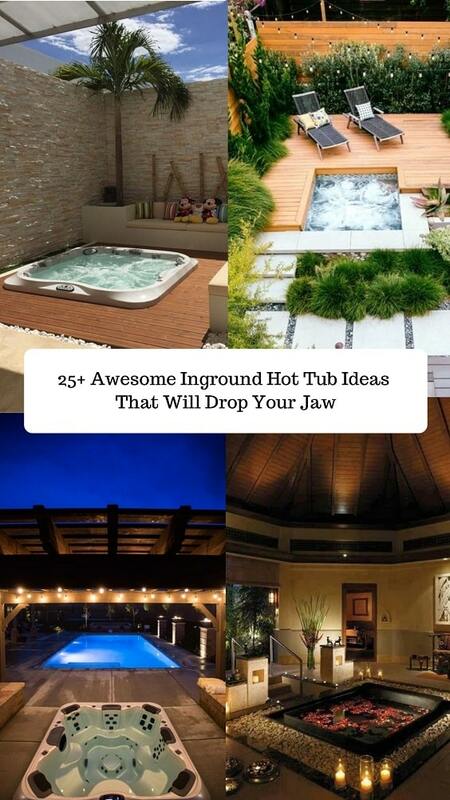 So those are the best inground hot tub ideas that we have picked just for you. They are totally inspiring to copy that will enhance the beauty and value of your house. Pick the best idea that you really love which suits your needs and taste very well. Keep in mind to always harmonize your hot tub area with the overall decoration of your house so you can have the one which looks and feels inviting. With such benefits, no wonder that many homeowners include a hot tub as an addition in their home improvement plan. You will have a more healthy lifestyle, a more beautiful home, and a more precious place to stay. 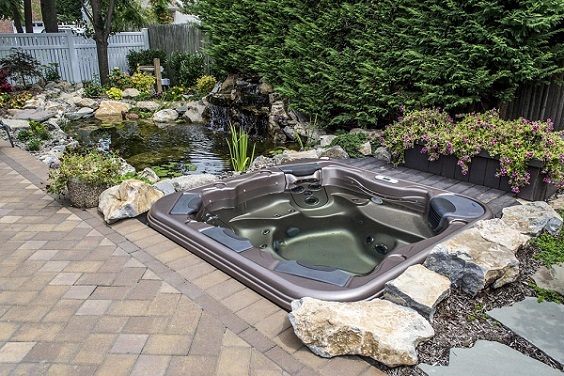 Therefore, it’s always a good idea to consider purchasing a hot tub if you have a plan to give some improvement to your beloved home. It may be quite tricky and pricey to build the inground hot tub, hot tub it’s totally worth it though. An inground hot tub is always the best option if you want to have a hot tub area which looks so attractive that will draw lots of attention.